Frugal experts often champion certain types of vacations as great ways to save money and have loads of carefree fun. Certainly, if you are adventuresome and seasoned, enjoy surprises, and consider travel challenges as a welcome break from the mundane, then you can have a blast on the cheap nearly anywhere, anytime. Traveling in the off-season to a destination that is highly desirable in the tourist season can mean lower expenses, particularly for lodging. If you are eager to explore an area or have specific activities in mind that are doable during this time period, then such a trip can be frugal and fun. Sometimes, though, off-season visits are disappointing. During an early spring trip to Wisconsin, my husband and I really enjoyed touring the capital city of Madison and the villages of Door County. But a ski resort that promoted a full list of amenities was a bad place to go outside of the winter months. At the time we visited, the place operated on a bare-bones staff and offered no amenities to us or the other couple staying there. We had to drive an hour or so to get food of any kind as even the resort's restaurant was closed. Before you go, plan what you’d like to do and determine if those things are possible. Make phone calls to locals rather than relying solely on website information. Ask hotel managers, outfitters, retailers, and restaurant owners when they plan to open for the season and get the specifics on operating hours. Inquire about hazardous conditions common during certain times of the year, like when melting snow causes flooding or when roads are closed due to icy conditions. Bring all-season and extreme-weather clothing including rain gear. Outdoor adventures can be fun and frugal options, especially if you camp and cook your own meals. Per day expenses are relatively low compared to, say, costs of a staying in a nice hotel in a large city or visiting Disney World and dining at restaurants. Despite the low entry cost to the great outdoors, adventuresome vacations can be expensive. For example, my husband and son are getting ready to go on a wilderness trek with the Boy Scouts. Besides paying for the trip itself (cross-country travel, ranch fees, etc. ), the cost of the gear is steep. They have had to acquire backpacks, lightweight tents, sleeping bags, and more. Similarly, when my family went on a cycling-camping vacation a few years ago, we found that acquiring and transporting gear was not cheap. Borrow items from friends if possible, especially if you are a camping or outdoors newbie. Find bargains on Craigslist or at used sporting goods stores. Compare the cost of renting gear at your destination vs. purchasing and hauling stuff from your home to the start of the adventure. Look at alternatives to extreme outdoorsy vacations (requiring extra but essential items like water purifiers) in favor of day hikes, canoe trips, etc. You may think that places not easily accessible and relatively unknown would have few visitors and, therefore, great prices to attract people nearly all year. Sure, you realize that exotically remote locations, like base camp at Mount Everest, are expensive. But traveling to a small town ought to be fun and frugal for the person wanting a break from the city. On another Upper Midwestern state tour, my husband and I traveled to various places in Minnesota. During a stay in the northern part of the state (near the Boundary Waters), I managed to select a nice property with several lodging options. I reserved a room that seemed like a reasonable choice, given the remoteness of the area. It seemed wasteful to pay nearly double for what I imagined to be a luxury suite when I could get a nice place for much less. But after one night in the budget-priced location, we were ready to leave — the bathroom was so tiny that even my five-foot self felt claustrophobic, we could hear upstairs guests walk across the room for what seemed like hours, and another guest moved our rocking chair (the one outside our room on the porch), leaving us with nothing and no way to enjoy the lake view from the room. I had misjudged the pricing, thinking that the accommodations I had chosen were cheaper because of the remoteness of location, not because, well, they were unaccommodating. Fortunately, we were able to move to a condo on the same property and loved the rest of our vacation. Similarly, a lodge in the Smoky Mountains of Tennessee accessible only by foot is pricey. Despite lack of electricity and running water in the rooms, the cost of lodging and meals can be comparable to a night's stay in Bermuda. Remote sites relatively unknown to most people can still be popular destinations for many. Lodging and services can be in high demand, not only from those who are a day's drive away but also for travelers interested in specific natural resources and outings. As a result, prices may be higher than similar accommodations in an area with plenty of hotels. Rather than focusing on how much money you can save by going to a thinly populated area, find the right spot for you and suitable lodging. If the pricing is a bit higher than you expected, consider why (there may be some great natural, recreational, and cultural attractions nearby) and take advantage of what the area has to offer. Even if you anticipate spending most of your time away from a hotel room or condo suite, find a place that you will enjoy and affords a good night's rest. You'll definitely save on nightly lodging if you stay at home. You may spend more on food if you go out for meals (as a way to try new restaurants in your city), but you should still come out ahead in terms of spending compared to a traditional vacation. The question then is not whether a staycation is frugal; the question is whether it is fun. For many people, relaxing at home is wonderful. But if you are self-employed, work from home, or are tethered digitally to your work, a staycation may not be a vacation at all. Instead, it will simply be a work-at-home week in lieu of a real vacation. Plus, if your friends or family members are staycationing with you, they may have different ideas about ways to have fun, want to sleep in rather than get an early start for a day's outing, or try to recommend alternate plans that don't mesh with what you envisioned. Make firm plans so that you won't default to your regular routine or allow your vacation to be derailed by friends when they hear that you will be taking time off from work but are staying in town. Take a day trip or visit a spa so that you can feel that you really did get away from it all, if just for several hours. State and national parks seem like a cheap and easy way to have fun, given low-cost or free entry fees. Some of my favorite, most memorable, and least expensive travels have been to state and national parks or national monuments, like Canyon de Chelly. There is often little to do in a park if the weather is bad. A few years ago, my husband and I took our children to a state park during spring break. Combining the supposed benefits of remote location, off-season travel, and the inexpensive nature of state parks, this trip now has its place our family lore as our worst-ever vacation. The state park may have been a great place to visit if the sun would have shone. But it didn’t. That meant that we were stuck inside most of the time, and there was little to do, either in the park or within reasonable driving distance.There were no movie theaters, bowling lanes, museums, or indoor rock climbing venues. The week was salvaged by a day trip to a national park, but this type of arrangement definitely made our not-to-do list. At the other extreme, last summer, we spent a few glorious days in a stunning national park. However, the lodging was not cheap and neither were the meals or food supplies (there were no grocery stores nearby). Camping would have involved hauling a trailer with all of our gear more than a thousand miles, and since we were visiting in the shoulder season, we would have been freezing for much of the time. So we had great fun, but not the frugal kind. Map out your park vacation. Don't simply figure out how to travel from your home to the park, whether by plane, train, or car. Look at a map of the entire area and plan outings to nearby locations based on your family's interests and tolerance for travel time of day trips. Build flexibility into your vacation. Plot a series of stays in various towns and cities, which can make a fun trip overall if one area is disappointing in terms of activities and amenities. Consider staying at a park near your home so that you can easily make adjustments to your vacation plans. To save money on national park visits, plan well in advance (several months at least) to snag lower-cost accommodations inside the park or stay outside of the park in a nearby hotel. Plan meals also, bringing your own supplies for breakfasts, lunches, and snacks. If you are great at scheduling, find ways to plan each day's activities so that you can avoid high-priced restaurants or long drives to reasonably priced ones. Take advantage of free activities rather than paying fees for those provided by outside vendors that operate within the park. If you are hoping for a fun and frugal vacation, do your research (start with Trip Advisor, but include phone calls to locals), ask friends about their experiences, and get real-world tips from travel bloggers like Nora Dunn and Myscha Theriault that fit your unique situation. In what ways have frugal travel experts led you astray? 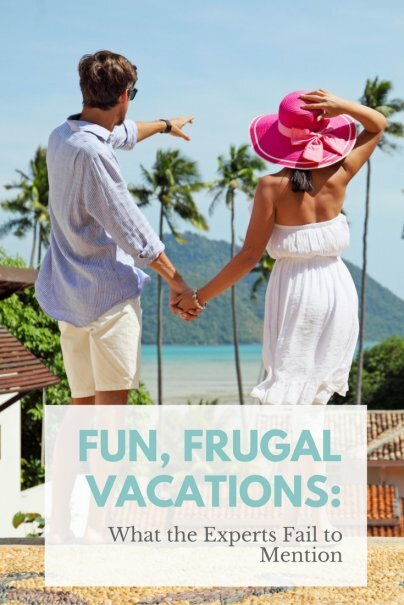 How have you had lots of fun on frugal vacations? Share your funny and enlightening stories in the comments. All of these points should be taken into consideration for off-season travel. I think things like kid's summer vacation from school is usually what keeps people from much off-season travel though. Just talking with some friends about year-round school options and how that affects vacation plans; though I love the idea of summer breaks, having one- or two-week long breaks a few times each year does allow parents to take their kids to places they may not otherwise. One year, the school system in my area had a week-long fall break and tons of people (not me, but lots of others) went to Disney World rather than visit during the summer. Off-season travel gave me what seemed like it might be the worst -- but then turned out to be the best -- vacation of my life. My boyfriend at the time and I went to Belize, arriving about two weeks before tourist season officially started. Exhausted, we napped immediately when we got in -- and woke up to discover that no one was at our hotel. No one was in the office, the restaurant was completely closed, and we couldn't even see lights on in any other rooms. When I complained the next day, we got a free room upgrade to a suite with a kitchen, and for the rest of the trip, we got to enjoy a small resort (and resort town) almost all to ourselves. It ended up being more frugal than we imagined, and we got to spend a lot more time talking with locals than we would have if it was full-on tourist season. But that easily could have gone VERY poorly. So yes, I agree -- make sure you know everything about the area in the off-season! That sounds like a blast -- glad that someone was at the hotel to complain to and help you out...I guess upgrading was easy with no one else around! One of my recent travels was to a place just before full tourist season and most of the staff had just started. I noticed some folks getting upset but fortunately, we were able to laugh about their missteps and just have a good time even though everything wasn't perfect. It's too bad your budget spot in northern Minnesota didn't pan out the way you hoped. We're big fans of doing lots of research before our trips, trying to find the best place for the right price. We'll often change our itinerary based on the cool hotels we find. Thanks for the extra resources including the budget ones from your website. I research also but find that tastes and expectations among reviewers vary so much sometimes that it can be hard to find the right place, and there are often nuances about a location that is difficult to sift through. Consistently poor reviews or consistently great ones though, usually do mean something. One thing I learned about Minnesota -- it's a beautiful state! We decided to go north on a whim, and didn't grasp how significant the protected wilderness area was (BWCA and surrounding area) and how in demand rooms might be. Though this idea doesn't mesh well with planning, I have seen folks stop in at the front desk and ask to see rooms before making a decision to stay somewhere. We have found that booking early can save us thousands. We booked a cruise a year ago. We scored a balcony room for three on a seven week cruise. It sailed from a port that was a 6 hour drive from our home. So we saved by not flying. The total cost - $2400. This included all meals, entertainment and of course our cabin. Cruises are a great deal right now, just shop around. One of the alternatives to Off-Season travel is going slightly before or after the tourist season starts. We took a family vacation in Colorado around the end of Spring a couple years ago and it was so much fun. It was not as crowded as it would have been during the peak of ski season, but it was still cold enough for us to hit the slopes. Those sound like great trips! Being prepared and having kids who are flexible sound like the perfect combination for fun adventures. I live in Michigan, and we have a few state parks that are close to tourist areas. Husband and I stayed just outside of Traverse City for around thirty dollars per night, which was much better than the one hundred plus dollars per night area hotels were charging. We were close to a beach, we visited some vineyards, saw some nice scenery, etc. It was good. My favorite state parks are the ones with showers and modern toilets. Fabulous. They frequently have outlets in the bathrooms so you can do your hair as well. If you're really lucky, you might be able to score a cabin for the cost of a campsite, and you'll have lots of privacy. We bought our tent and sleeping bags at Goodwill for around twenty bucks. Our local Goodwill seems to end up with a lot of tents in extremely good condition. Ours was new. Camping can get really expensive if you're a hobbyist and want to "rough it," but it's pretty cheap if you're just using a modern campsite in lieu of a hotel. Off season travel is the BEST! Even during the week, I always thought it would be amazing if all of your friends worked on the weekends and had the middle of the week off. There would never be lines. Outdoor adventures is another great idea, weather pending of course. Nature rarely charges a fee to enjoy her!